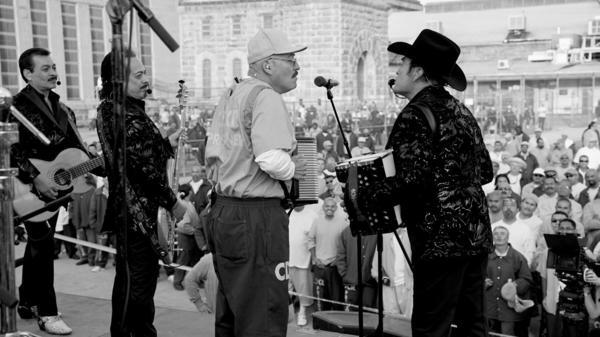 Vocalist and accordion player Jorge Hernández engages the crowd of inmates in the main yard of Folsom State Prison. Hernán and Jorge Hernández from Los Tigres del Norte perform at Folsom State Prison. 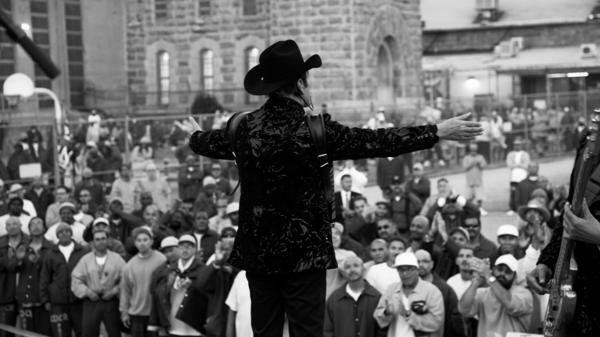 Los Tigres del Norte perform in front of about 800 inmates at Folsom Prison in front of the iconic Greystone Chapel. Eduardo and Hernán Hernández watch inmate Manuel Mena perform as a guest of the band in front of fellow inmates. Fifty years ago, Johnny Cash performed at Folsom State Prison in Folsom, Calif. The January 1968 concert and live album it produced, At Folsom Prison, helped revitalize Cash's career, inspiring him to testify for prison reform and cementing his reputation as a voice for the downtrodden. Earlier this week, the Mexican norteño band Los Tigres del Norte followed in Cash's footsteps and became the first major Latin act to play at Folsom since the rock and roll star's historic concert five decades ago. The spirit of Johnny Cash is everywhere at the prison-yard gig. Los Tigres and crew walk through the same massive security gates that Cash and his musicians did on that cloudy, winter morning. The musicians' green room is in the prison's Greystone Chapel — the same chapel immortalized in song on Cash's 1968 album. But somethings have changed with time. When Cash played his prison show in '68, the inmate population at Folsom was most white. Today, it's mostly black and Latino. The magic number of 50 hangs in the air for Los Tigres. It's been 50 years since Cash's performance and 50 years since the Mexican band played its first gig in the United States, which, ironically, was also at a prison. "When we came to this country, the first performance that we did was in a prison in Soledad, California," Jorge Hernández, the band's vocalist and accordionist, says. "It reminds us it's a blessing that we can be here at Folsom playing and celebrating our coming to this country, performing in a prison, but also performing now at Folsom Prison." Los Tigres del Norte have sold over 30 million albums and the band's fans span generations of Mexicans. The band's songs like "La Jaula de Oro," a lament about struggling to protect one's undocumented family in the United States, set immigrants' stories to music. Two years ago, Los Tigres submitted a request to play at Folsom. 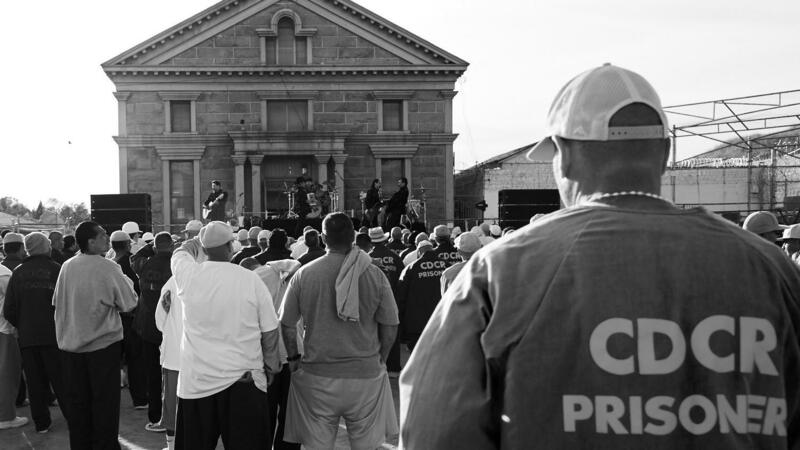 A few months ago, the band finally got the blessing of the California Department of Corrections and Rehabilitation to have a performance at the prison. "When Johnny Cash first came in, it probably wasn't real popular with the staff or the warden at the time," Ralph Diaz, the Department's Undersecretary of Operations, says. "But in the end, he wanted to let the population know, 'There is a voice out there for you. I'm that voice.'" Diaz, on the other hand, is most definitely a Los Tigres fan. "I grew up listening to Los Tigres at grandma's kitchen table to the time I got my own stereo," he says. Manuel Mena is a Los Tigres fan, too. Born in Tijuana, Mexico, Mena says Los Tigres inspired him to start his own band. One night after a show, Mena had an altercation with a fan who threatened him. Mena killed the man. That landed him in Folsom for 36 years to life. "We are the forgotten of society," Mena says in Spanish. "And to have the privilege of experiencing something like this? Well, it means we haven't been completely forgotten. It means there's someone who remembers us, someone who gives us the strength to keep going, the strength to keep moving forward." About 800 denim-clad men stand in the main prison yard under wispy clouds and a bright blue sky for the performance, as well as the watchful eyes of correctional officers on the ground and in five gun towers surrounding the yard. Many of the men sing along. Others shout out requests. A few more dance alone, seemingly lost in a moment of nostalgia. Before it became famous by way of Cash's performance, "Greystone Chapel" was written by Glen Sherley, a Folsom inmate serving time for armed robbery. In the same tradition, Los Tigres del Norte invite Mena to play accordion on their norteño rendition of "Folsom Prison Blues." Univision is recording the performance for a documentary. It's being produced by Grammy- and Oscar-winning musician Gustavo Santaolalla, who echoes Cash's belief in the power of music to give inmates a voice. "It's a way actually of not only entertaining themselves, but also to open their souls, and to open their minds to the possibility of a better world," Santaolalla says. After the show, band member Luis Hernández stands on the steps of the chapel, reflecting on what just happened. "It was just so emotional to see these people here singing our songs and transporting themselves back to maybe how their lives could be, or maybe the mistakes they made," he says. "It's impressive, when you come here and sing in front of these people, how you can bring them happiness, and how you can bring them their life back." Inmates and staff at Folsom Prison are going to hear a legendary act tonight. CHANG: It's the second night that Los Tigres del Norte is playing at Folsom, the first major Latin act to ever do so. And in the back of their minds, they're thinking about the legendary act that played there 50 years ago. JOHNNY CASH: Hello. I'm Johnny Cash. CHANG: Folsom's inmate population has dramatically changed since that show. NPR's Felix Contreras was at the prison for last night's performance by Los Tigres. FELIX CONTRERAS, BYLINE: The spirit of Johnny Cash is everywhere on this gig. UNIDENTIFIED PERSON #1: Get to keep that as a souvenir. CONTRERAS: ...As did Cash and his musicians on a cloudy January morning in 1968. UNIDENTIFIED PERSON #2: Como estas? CONTRERAS: Today the musicians' green room is in the prison's Greystone Chapel, immortalized in song on the 1968 album. CASH: (Singing) There's a greystone chapel here at Folsom, a house of worship in this den of sin. CONTRERAS: And the magic number of 50 hangs in the air - 50 years since Cash's performance and 50 years since Los Tigres del Norte played its first gig in another prison. JORGE HERNANDEZ: When we came to this country, the first performance that we did in this country was in a prison in Soledad, Calif.
CONTRERAS: Jorge Hernandez is the band's vocalist and plays accordion. J. HERNANDEZ: It reminds us it's a blessing that we can accomplish to be here in Folsom, playing and celebrating our coming to this country, performing in a prison but also performing now in Folsom's prison. CONTRERAS: Los Tigres del Norte have sold over 30 million albums, and their fans span generations of Mexican immigrants. CONTRERAS: Their stories are the subjects of the band's songs. LOS TIGRES DEL NORTE: (Singing in Spanish). CONTRERAS: Two years ago, the musicians submitted a request to play at Folsom. When Johnny Cash performed here, the inmate population was predominantly white. Today it's mostly black and Latino. And a few months ago, the band finally got the blessing of the California Department of Corrections and Rehabilitation for this show. RALPH DIAZ: When Johnny Cash first came in, it probably wasn't real popular by the staff or the warden at the time. CONTRERAS: Ralph Diaz is the department's undersecretary of operations in Sacramento. DIAZ: But in the end, he just wanted to let the population know there's a voice out there for you. I'm that voice. CONTRERAS: Are you a Tigres fan? DIAZ: Oh, most definitely. I grew up listening to Los Tigres at grandma's kitchen table to the time I got my own stereo. So definitely, Los Tigres have been part of the Diaz family. CONTRERAS: Another Los Tigres fan is Manuel Mena. He's from Tijuana, Mexico, and he says Los Tigres inspired him to start his own band. Then one night after a show, he got into a scuffle with a fan who threatened him, and Mena killed the man. And that landed him in Folsom for 36 years to life. MANUEL MENA: (Through interpreter) We are the forgotten of society. And to have the privilege of experiencing something like this, well, it means we haven't been completely forgotten. It means there's someone who remembers us, someone who gives us the strength to keep going, the strength to keep moving forward. 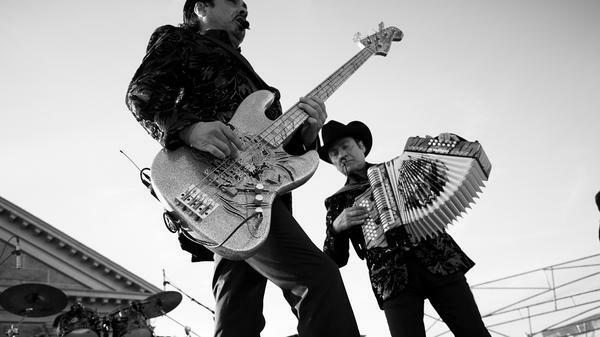 CONTRERAS: And in almost the same way that Cash performed a song written by a Folsom inmate, Los Tigres del Norte invited Mena to play accordion on one of their songs. CONTRERAS: This performance is being recorded for a documentary for the Univision television network. It's being produced by multiple Grammy- and Oscar-winning musician Gustavo Santaolalla, who echoes Cash's belief in the power of music to give the inmates a voice. GUSTAVO SANTAOLALLA: Getting them close to art and music, it's a way, actually, not only of entertaining themselves but also to open their souls and to open their minds to the possibility of a better world. CONTRERAS: About 800 denim-clad men stand in the prison yard under wispy clouds and a bright blue sky and the watchful eyes of correctional officers on the ground and in five gun towers surrounding the yard. Many sing along. Others shout out requests. And a few more dance alone, seemingly lost in a moment of nostalgia. And afterwards, band member Luis Hernandez stands on the steps of the chapel reflecting on what just happened. LUIS HERNANDEZ: It was just so emotional to see these people here singing our songs and transporting themselves to, maybe, how their lives could be or maybe the mistakes they make. And, you know, they relate to our songs in that way. It's impressive how, when you come here and sing in front of these people, how you can bring them happiness, how can you bring them their life back. CASH: (Singing) It's a flower of light in a field of darkness, and it's giving me the strength to carry on. CONTRERAS: And tonight, the inmates of Folsom Prison got a little of that strength from Los Tigres del Norte. Felix Contreras, NPR News, Folsom, Calif.
LOS TIGRES DEL NORTE: (Singing in Spanish). Transcript provided by NPR, Copyright NPR.